NTT Com Asia (NTTCA) proposed to install a telecommunication cable (Asia Submarine-cable Express (ASE) cable) of approximately 7,200 km in length, connecting Japan and Singapore with branches to the Philippines, Hong Kong SAR (HKSAR) and Malaysia. NTTCA is responsible for securing the approval to land the ASE cable in Tseung Kwan O, Hong Kong SAR (HKSAR). The landing site is at a new Beach Manhole (BMH) and the cable is ultimately connected with a Data Centre in Tseung Kwan O (TKO) Industrial Estate. From Tseung Kwan O, the cable extends westward approaching the Tathong Channel. Near to Cape Collinson, the cable is approximately parallel to the Tathong Channel until north of Waglan Island where the cable travels eastward to the boundary of HKSAR waters where it enters the South China Sea. The total length of cable in Hong Kong SAR waters is approximately 33.5 km. A map of the cable route is presented in Figure 1.1. Marine works for the cable installation was completed in January 2013. In accordance with the EM&A Manual () , Post Project Coral Survey should be conducted within one month after completion of the marine works in order to determine any detectable changes in coral conditions which may be caused by the cable installation works. 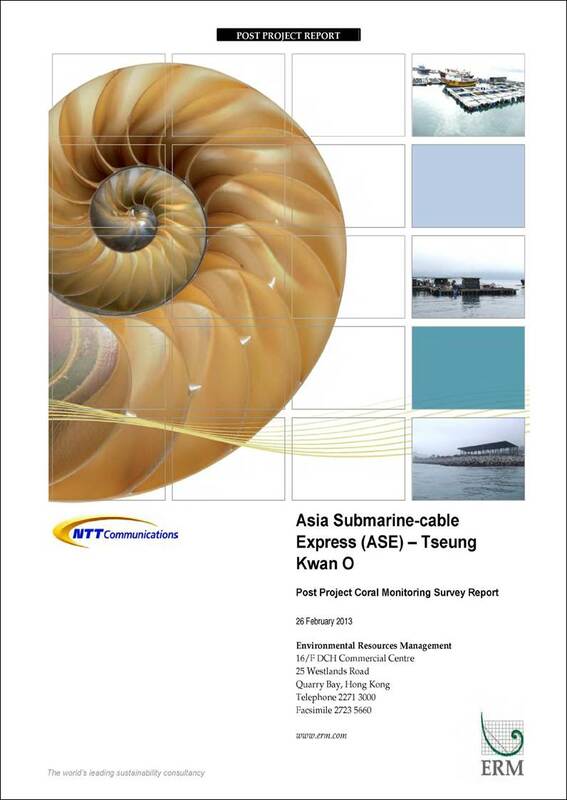 This Post Project Coral Monitoring Survey Report (“the Report”) is prepared by ERM-Hong Kong, Limited (ERM) on behalf of NTTCA to present the methodology and findings of the Post Project Coral Monitoring Survey in accordance with requirements of the EM&A Manual. Presents the Post Project Coral Monitoring Survey methodology, parameters monitored, monitoring locations and depth in accordance with the EM&A Manual. Reviews the conditions and health status of corals at the monitoring stations as recorded during the Post Project Coral Monitoring Survey for comparison with the baseline coral information in order to determine any detectable changes that may be caused by the cable installation works of the Project. Concludes findings from the Post Project Coral Monitoring Survey. This section presents the methodology of the Post Project Coral Monitoring Survey which is undertaken within one month after the marine works of the Project. The methodology adopted is the same as that for the Baseline Coral Survey undertaken before the cable installation works, except for the qualitative spot dive survey which was conducted for the Baseline Survey only to determine the locations of monitoring transects. The employment of the same methodology would allow for direct comparison of coral conditions and health status before and after the cable installation works and hence, determines any detectable changes in coral assemblages concerned after the works. A standardised semi-quantitative REA survey technique was used to investigate the general conditions of the coral communities (hard, soft and black corals) associated with subtidal hard bottom habitats at the Monitoring and Control Stations. The collection of REA data during the Baseline Coral Survey and Post Project Coral Monitoring Survey would allow for a direct comparison of coral conditions before and after the cable installation works of the Project in order to determine any detectable changes in conditions which may be caused by the works. The REA technique allows semi-quantitative information on the ecological attributes of the subtidal habitat to be obtained in a relatively simple way without compromising scientific rigour. 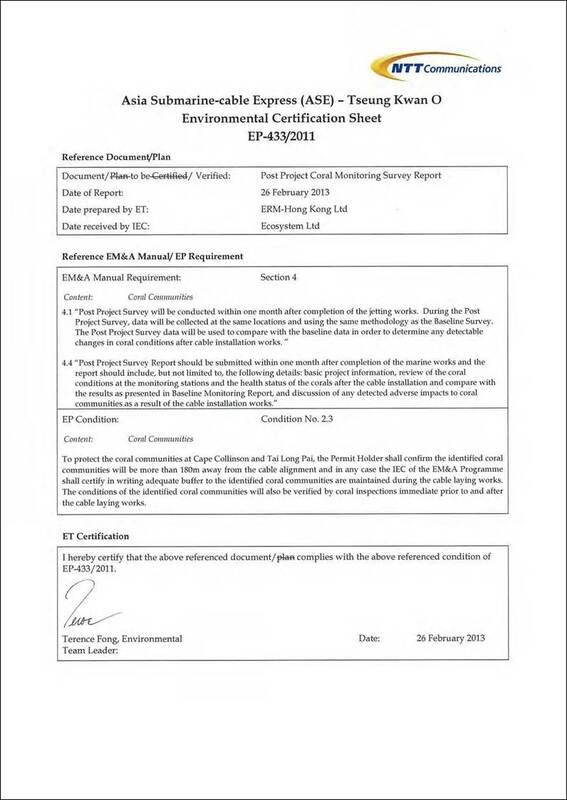 This technique is the standard practices for EIA and EM&A marine ecological surveys in Hong Kong and has been modified from the standardised REA survey technique established for the assessment of coral communities on the Great Barrier Reef () for marine environment of Hong Kong (). The location of the REA transects as well as the depth ranges of the monitored depth regions were determined based on findings from the qualitative spot dive survey which were undertaken during the baseline monitoring. A total of three (3) REA transects were monitored at each depth region of Cape Collinson and Tung Lung Chau, while two (2) transects were monitored at each depth region of Tai Long Pai due to smaller area of this Monitoring Station. Following the laying of the transect line, the coral specialist swam along the transect slowly and conducted the REA survey. The REA methodology encompassed an assessment of the benthic cover (Tier I) and taxon abundance (Tier II) undertaken in a swathe ~ 4 m wide, 2 m either side of each transect. The belt transect width was dependent on underwater visibility and might be adjusted to a swathe ~ 2 m wide, 1 m either side of each transect in case of reduced visibility. An explanation of the two assessment categories (Tiers) used in the survey is presented below. Upon the completion of each survey transect, five ecological and seven substratum attributes were assigned to one of seven standard ranked (ordinal) categories (Tables 2.1 and 2.2). Although coral tagging is a common practice for repeated monitoring of individual colony, this technique was not employed in this monitoring programme due to difficulties in re-locating the tagged corals given the generally low visibility in the area and low light conditions in deep water. Instead, colonies of similar growth forms and size would be selected for the Baseline and Post Project Coral Monitoring Surveys. This section presents findings of the Post Project Coral Monitoring Survey which is undertaken within one month after completion of jetting works for the cable installation of the Project. Findings from the Post Project Coral Monitoring Survey are compared with those obtained from the Baseline Coral Survey which was undertaken before cable installations works in order to determine any detectable changes in coral conditions and health status and the relationship of such changes, if any, to the cable installation works of the Project. The Post Project Coral Monitoring Survey was conducted over two days on 18 and 19 February 2013. The weather condition was mainly sunny, with light (Force 2) to moderate (Force 3) east to southeasterly winds. Slight to moderate swell presented in the sea on the two survey days. The underwater visibility was moderate and generally ranged between 3 to 5 m. Coral communities at Zone A: Cape Collinson, Zone B: Tai Long Pai and Zone C: Tung Lung Chau were monitored (see Figure 2.1 for monitoring locations). Detailed description and discussion of the monitoring results are presented below. Seabed compositions along each monitored transects of Zone A to C are shown in Tables 3.1, 3.2a and 3.2b. Each taxon in the inventory was ranked in terms of relative abundance in the community and results recorded during the Baseline and Post Project Coral Monitoring Surveys are shown in Table 3.3a and 3.3b, respectively. Findings of the REA surveys are discussed below. The seabed at the REA survey area of Zone A was mainly composed of bedrocks in shallow depth region (2-5 m CD) and bedrocks and boulders at deep depth region (5-15m CD), except at the deep depth region of Transect 1 which was mainly composed of sand and small boulders (Tables 3.2a-b). The estimated percentage covers of the major abiotic attributes were noted to be similar between the Baseline and Post Project Coral Monitoring Surveys. Both hard coral and octocoral covers were less than 5% in shallow depth region (2-5 m CD) as recorded during both the Baseline and Post Project Coral Monitoring Surveys (Tables 3.2a-b). Compositions of coral assemblages were also noted to be similar between the Baseline and Post Project Coral Monitoring Surveys, with six (6) hard coral and eight (8) octocoral species recorded during both surveys (Tables 3.3a-b). Oulastrea crispata and Goniopora stutchburyi were the dominant hard coral species recorded while Echinomuricea sp. was the dominant octocoral species found. Octocoral cover was found between 6-10% while no hard coral was recorded in deep depth region (5-15 m CD) during both the Baseline and Post Project Coral Monitoring Survey (Tables 3.2a-b). Species compositions of coral assemblages were similar between the Baseline and Post Project Coral Monitoring Surveys, with 11 octocoral species recorded during the Baseline Coral Survey while 13 octocoral species were recorded during the Post Project Coral Monitoring Survey (Tables 3.3a-b). Echinomuricea sp. and Dendronephthya sp. were the dominant octocoral species recorded. Less than 5% of macroalgae cover was recorded at both shallow and deep depth regions during the Post Project Coral Monitoring in February 2013 (Tables 3.2a-b). The presence of macroalgae in winter during the Post Project Coral Monitoring in February 2013 but not during the Baseline Coral Survey in September 2012 is due to the natural seasonal cycle as with lower seawater temperature in winter which triggered the growth of macroalgae. Overall, comparison of the Baseline and Post Project Coral Monitoring Survey results did not indicate any detectable changes in coral conditions at Zone A before and after the cable installation works. Therefore, there did not appear to be any unacceptable ecological impacts to coral assemblages at Zone A as a result of the cable installation works. Seabed at the REA survey area of Zone B was mainly composed of bedrocks in both shallow (2-5 m CD) and deep (5-15m CD) depth regions (Tables 3.2a-b). The estimated percentage covers of the major abiotic attributes were noted to be similar between the Baseline and Post Project Coral Monitoring Surveys. Hard coral and octocoral covers were less than 5% and about 5% in shallow depth region (2-5 m CD) respectively as recorded during both the Baseline and Post Project Coral Monitoring Surveys (Tables 3.2a-b). Species compositions of coral assemblages were also similar between the Baseline and Post Project Coral Monitoring Surveys, with four (4) hard coral and five (5) octocoral species recorded respectively (Tables 3.3a-b). Goniopora stutchburyi and Tubastrea sp. were the dominant hard coral species while Dendronephthya sp. was the dominant octocoral species recorded during both surveys. Octocoral cover was between 11 – 30% in deep depth region (5-15 m CD) during both the Baseline and Post Project Coral Monitoring Surveys (Tables 3.2a-b). No hard coral was found in the deep depth region. Species compositions of coral assemblages were similar between the Baseline and Post Project Coral Monitoring Surveys, with 10 octocoral species recorded during both surveys (Tables 3.3a-b). Echinomuricea sp. and Dendronephthya sp. were the dominant octocoral species recorded. Macroalgae covers were found to be less than 5% and between 6-10% at shallow and deep depth regions, respectively, during the Post Project Coral Monitoring in February 2013 (Tables 3.2a-b). The record of macroalgae during the Post Project Coral Monitoring Survey only is due to the natural seasonal cycle in winter as explained above. Overall, comparison of the Baseline and Post Project Coral Monitoring Survey results did not indicate any detectable changes in coral conditions at Zone B before and after the cable installation works. Therefore, there did not appear to be any unacceptable ecological impacts to coral assemblages at Zone B as a result of the cable installation works. Seabed at the REA survey area of Zone C was mainly composed of bedrocks, large and small boulders in shallow depth region (2-5 m CD) whereas at the deep depth region (5-15m CD) was predominantly composed of bedrocks (Tables 3.2a-b). The estimated percentage covers of the major abiotic attributes were noted to be similar between the Baseline and Post Project Coral Monitoring Surveys. Both hard coral and octocoral covers were less than 5% in shallow depth region (2-5 m CD) as recorded during both the Baseline and Post Project Coral Monitoring Surveys (Tables 3.2a-b). Compositions of coral assemblages were also noted to be similar between both surveys with nine (9) hard coral and three (3) octocoral species recorded in the Baseline Coral Survey, and 10 hard coral species and three (3) octocoral species recorded in the Post Project Coral Monitoring Survey (Tables 3.3a-b). Montipora venosa and Goniopora stutchburyi were the dominant hard coral species while Dendronephthya sp. was the dominant octocoral species recorded. Both hard coral and octocoral covers were less than 5% and less than 10% in deep (5-15 m CD) depth region respectively during both the Baseline Coral Survey and Post Project Coral Monitoring Survey (Tables 3.2a-b). Comparison of coral assemblages were similar between the Baseline and Post Project Coral Monitoring Surveys, with five (5) hard coral species and seven (7) octocoral species recorded during the Baseline Coral Survey, whereas five (5) hard coral species and 11 octocoral species were recorded during the Post Project Coral Monitoring (Tables 3.3a-b). Dendronephthya sp. and Scleronephythya sp. were the dominant octocoral species recorded. As for Zone A and Zone B, macroalgae were recorded at the deep depth region of Zone C during the Post Project Coral Monitoring Survey in February 2013 but not the Baseline Coral Survey in September 2012 (Tables 3.2a-b) due to the natural seasonal cycle in winter which triggered the growth of seaweed. Overall, comparison of the Baseline and Post Project Coral Monitoring Survey results did not indicate any detectable changes in coral conditions at Zone C which serves as a Control station that is unlikely to be affected by the cable installation works. The seabed was mainly composed of sand (~50%). No hard coral colonies were found. The octocoral cover was low (between 6-10%) with gorgonians growing on sand. Seven species of octocorals (Echinomuricea sp., Paraplexaura sp., Menella sp., Euplexaura sp., Muricella sp., Sinularia sp. and Dendronephthya sp.) were recorded. The seabed was mainly composed of bedrocks (~50%). No hard coral colonies were found. The octocoral cover was low (between 6-10%) with 6 species (Dendronethphya sp., Dichotella sp., Paraplexaura sp., Echinomuricea sp. and Euplexaura sp. and Viminella sp.) recorded. Two species of black corals, Antipathes curvata and Cirrhipathes sp., were recorded. The seabed was mainly composed of bedrocks (~60%). The hard coral cover was low (< 5%) with 3 hard coral species Oulastrea crispata, Goniopora stutchburyi and Plesiastrea versipora recorded. The octocoral cover was low (< 5%) with 7 species (Dendronethphya sp., Scleronephthya gracillicum, Ellisella sp. Echinomuricea sp., Viminella sp., Paraplexaura sp., Euplexaura sp. and Menella sp.) recorded. The seabed was mainly composed of bedrocks (~60%). No hard coral species was found. The octocoral cover was between 6-10% with 6 species (Paraplexaura sp., Echinomuricea sp., Euplexaura sp., Anthogorgia sp., Dendronephthya sp. and Scleronephthya gracillicum) recorded. The seabed was mainly composed of bedrocks (> 80%). No hard coral species was recorded. The octocoral cover was between 11-30% with 8 species (Dendronephthya sp., Menella sp., Euplexaura sp., Paraplexaura sp., Anthogorgia sp., Acanthogorgia sp., Verrucella sp. and Echinomuricea sp.) recorded. Black coral colonies, Antipathes curvata and Cirrhipathes sp. were observed. The seabed was mainly composed of bedrocks (> 80%). No hard coral species were recorded. The octocoral cover was between 11-30% with 7 species (Dendronephthya sp., Menella sp., Euplexaura sp., Paraplexaura sp., Anthogorgia sp., Verrucella sp. and Echinomuricea sp.) recorded. Black coral colonies, Antipathes curvata and Cirrhipathes sp. were observed. The seabed was mainly composed of bedrocks (~80%). The hard coral cover was low (< 5%) with 7 hermatypic hard coral species Goniopora stutchburyi, Psammocora superficialis, Cyphastrea chalcidicum, Plesiastrea versipora, Porites lobata, Montipora mollis and Montipora venosa recorded. One species of ahermatypic hard coral Tubastrea/ Dendrophyllia sp. 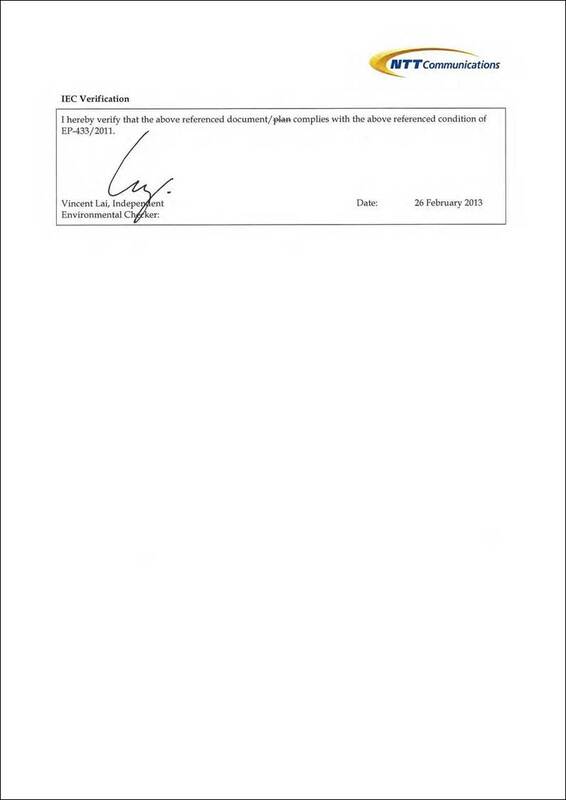 was recorded. The octocoral cover was very low (< 5%) with Dendronephthya sp. and Scleronephthya gracillicum recorded. The seabed was mainly composed of bedrocks (~60%). The hard coral cover was low (<5%). The octocoral cover was low (< 10%) with Euplexaura sp., Paraplexaura sp., Dendronephthya sp. and Scleronephthya gracillicum recorded. The seabed was mainly composed of bedrocks (~40%). The hard coral cover was low (< 5%) with 7 species Montipora peltiformis, Porites lobata, Cyphastrea chalcidicum, Favites chinensis, Goniopora stutchburyi, Montipora venosa and Plesiastrea verisipora recorded. One species of ahermatypic hard coral Tubastrea/ Dendrophyllia sp. was recorded. The octocoral cover was very low (< 5%) with only a few small colonies of Dendronephthya sp. recorded. The seabed was mainly composed of bedrocks (~80%). The hard coral cover was low (< 5%) with 3 species Plesiastrea versipora, Porites lobata and Psammocora superficialis recorded. The octocoral cover was low (< 10%) with Acanthogorgia sp., Echinomuricea sp., Euplexaura sp., Menella sp., Dendronephthya sp. and Scleronephthya gracillicum recorded. The seabed was mainly composed of bedrocks and small boulders. The hard coral cover was low (< 5%) with 5 species Montipora venosa, Porites lobata, Goniopora stutchburyi, Plesiastrea verisipora and Cyphastrea chalcidicum recorded. One species of ahermatypic hard coral Tubastrea/ Dendrophyllia sp. was recorded. The octocoral cover was very low (< 5%) with Echinomuricea sp. recorded. The seabed was mainly composed of bedrocks (50%). The hard coral cover was low (< 5%) with 4 species Montipora peltiformis, Goniopora stutchburyi, Cyphastrea chalcidicum and Psammocora superficialis recorded. The octocoral cover was low (< 10%) with Paraminabea sp., Euplexaura sp., Echinogorgia sp., Dendronephthya sp. and Scleronephthya gracillicum recorded. Two species of black corals, Antipathes curvata and Cirrhipathes sp., were recorded. (b) 1=<5% Cover, 2= 6-10% Cover, 3 = 11-30% Cover, 4 = 31-50% Cover, 5 = 51-75% Cover, 6 = 76-100% Cover. Also refer to Table 2.2. * Abundance rating (refer to Table 2.3): 1 = rare; 2 = uncommon; 3 = common; 4 = abundant.